Home > Personal Details > What is Shoulder Surfing? The notion of shoulder surfing is something that perhaps many find a little bizarre. It is something that each of us does at one point in time in our lives and sometimes without even realising we are doing it. But there are those among us who do it all the time in the hope of learning vital pieces of information about us. 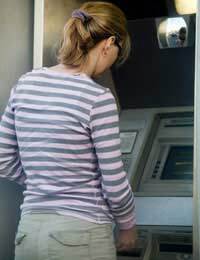 Basically shoulder surfing is looking over someone's shoulder to see what information they are handing over or what PIN (Personal Identification Number) they are entering into a bank machine keypad or Chip and PIN device in a supermarket. It may sound unimportant but this trend is one that can lead to the loss of many millions of pounds every year and also the loss of information that is vital to how people run their daily lives. There will have been a time when perhaps you thought someone was watching you while you were walking down the street, or standing in the queue in a shop or using an ATM (Automatic Teller Machine) and you may have put this feeling down to nothing more than slight anxiety or paranoia. But in actual fact the reality is you may well have been under observation. Who does Shoulder Surfing Work? Firstly it is important to note that the process of shoulder surfing is not as straight forward as it may sound. It really isn't simply a case of peering over someone's shoulder and then writing down the information, there is a lot more to it. Most gangs who operate using this process operate two-fold. One half of the gang are responsible for following individuals who have been selected as targets and the other half are charged with the task of getting the details for their credit or debit cards. It may sound long winded but depending on the circumstances the whole process can take only a matter of minutes. Once the gang are in possession of the card and the PIN number they then proceed to empty as much money out of the victim's bank account before the card can be frozen. Depending on whether or not the victim has access to a telephone and is in receipt of the relevant information to speak to their bank and credit card provider this can take some hours in which time the gang have removed all or most of the contents of an account. Always use bank machines in public places - never use them in out of the way locations where there is a danger of being robbed. Memorise your PIN number - never write it done and under no circumstances leave it in a wallet or purse along with your cars. You should never carry letters or statements from banks or building societies about your person. These documents along with your credit or debit card can be a gift to any would be robber.